You can edit a song’s tags by right clicking on it and selecting Edit Tags. In addition to manually entering the tags, if the song’s filename contains information about all or some of the tags, you can use the Edit tags from path tab to populate these tags automatically. Please see editing tags from path below describing the process for several songs (the process is the same). To edit tags for several songs at once, select those songs (using Ctrl or Shift), then right click and “Edit Tags”. 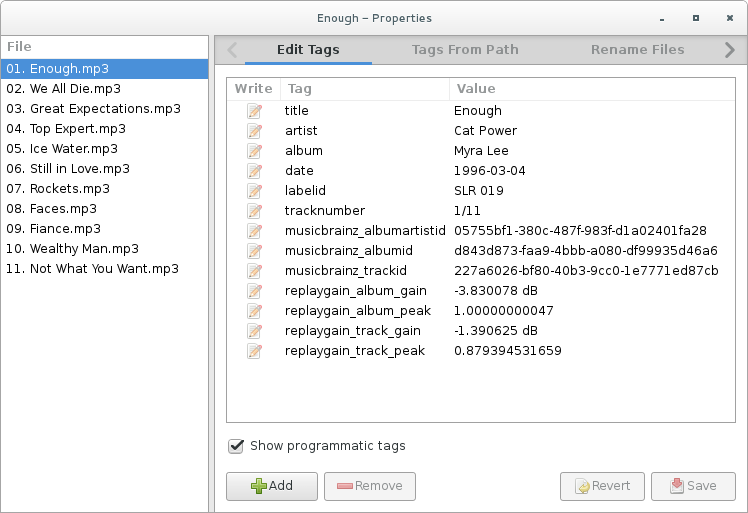 The tab Tags from Path lets you batch edit tags that differ across songs, such as title, by using the filename as input. Note that you can customize the pattern that the tag editor uses to extract the tags from the filename: just imitate the pattern you see for your files, putting the relevant tag name in angular brackets. Note that you can omit the file extension in your pattern. Click on Preview to see how your pattern would be interpreted for each song. The preview is shown to the right of the current value; you may have to scroll right to see it. In that case, you probably want to check the boxes for Replace underscores with spaces and Title-case tags. Note that QL automatically digs as far upwards in the folder hierarchy as it needs to given the pattern you put in, so you don’t need to enter any (potentially complex) folder structure that is above the needed info. You can see recent patterns you used by clicking on the drop down arrow to the right of the pattern input field. Additionally, clicking on Edit saved values in the drop-down that opens will let you save patterns and optionally name them. Use this for patterns that you apply frequently. If you leave the Name field blank for your pattern, the name will be identical to the pattern. The Track Numbers tab in the tag editing window lets you batch edit track numbers ascending across the files. If your files are in the correct order, you simply check that you like the Start from and Total tracks values. If you put in any value greater than one for Total tracks, QL will use a tracknumber pattern tracknumber/totaltracks , e.g. 2/12 for Total tracks = 12. If you only want a single number for the track number, set Total tracks to zero. If your files are not in the correct order, for example because they are sorted alphabetically, you can drag and drop them into the desired order in the File field inside the Track numbers tab of the tag editing window before (optionally) clicking preview and then save. QL also lets you rename the files of songs based on tags, either for one song or for several songs. Edit patterns the same way you would for Edit tags from path (see above). This feature even lets you move them to a different directory; for more info see the renaming files guide. If a tag contains a value that can be regarded as multiple tag values, it is often possible to split the tag. This can be done by right-clicking on the tag and then selecting the appropriate split in the Split Tag menu. There are in general two types of tag splitting possible: splitting on a single character and subtag splitting (extracting values in enclosures). The separating characters for both can be configured in the Tags tab in the preferences. Splitting on a single character - like , or & - will split a tag into multiple tags of the same type, but with different values. An example of this can be an artist tag with the value Foo, Bar, that can be split into two separate tags artist = Foo and artist = Bar. With subtag splitting, the end of the tag value must contain a value enclosed in some pair of characters - like () or . Depending on the type of tag, the enclosed value can then be extracted and put in a new tag. An example of this can be an album tag with the value Album (CD 1), which can be split into album = Album and discnumber = 1. The enclosure can also contain multiple values separated by a single-character separator as explained above, like artist = Foo (Bar, Baz), which can be split into artist = Foo, performer = Bar and performer = Baz.